Mansfield was a New Zealand born author recognised internationally as one of the foremost pioneers in modern literature. The Garden Party is one of her best known works. Mansfield completed ‘The Garden Party’ in 1922 but it was apparently inspired by an event that took place in 1907 in a Wellington garden which was then a few years old. So the aim has been to use plants, design detail, food and architecture appropriate to that Edwardian period in New Zealand. 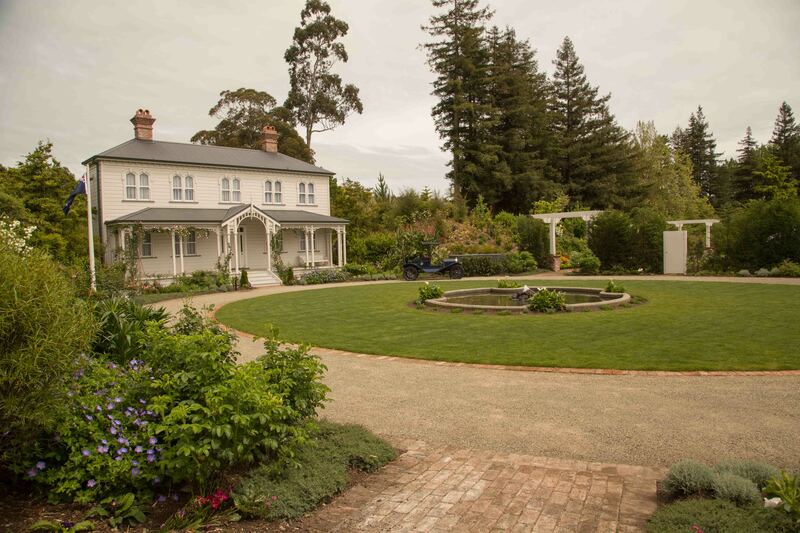 While gardens developed at that time were diverse there were certainly common elements like sweeping, looping or circular gravel driveways leading up to the front door. There were often large lawns, and in larger gardens there was generally a lawn tennis court. Ornamental ponds with a fountain were often located in the centre of the entry drive. Roses were always popular and there was a fashion for oriental plants such as: maples, cherries, wisteria, camellia, rhododendrons and bamboo. New Zealand natives were starting to be used, such as the karaka hedge on the far side of the tennis court that’s specifically mentioned in the story. While the central portions of this garden are filled with old fashioned roses and other exotics plants popular at the time, the hills behind are planted in New Zealand plants that may have grown on the Wellington hills. Gardens of this period were often set against clearings in the bush so these hills of native bush have been used to frame this garden. Architectural details have been selected to match the period like the bench seats and pergola. While there are readily available pictures of the houses the Mansfield family lived in, they weren’t particularly attractive or suited to the orientation and budget of this garden. So a facade design was chosen appropriate to this period that is similar to her parents’ house in Tinakori Road, Wellington. There are the particular ‘Garden Party’ touches such as: the marquee that workmen have set up against the karaka hedge on the tennis court. They placed the “very small band” in another corner of the court. Laura’s mother is having a meltdown in the upstairs bedroom, the sun is (hopefully) shining and everything is ready for the party to begin. In the 1900s New Zealand experienced a decade of exciting new inventions. The radio and telephone became mainstream, as did the motor car. Owning a car meant you had “arrived”. The motor car and ‘motoring’ became an addition to the fashion of taking rural outings to enjoy the fresh air. 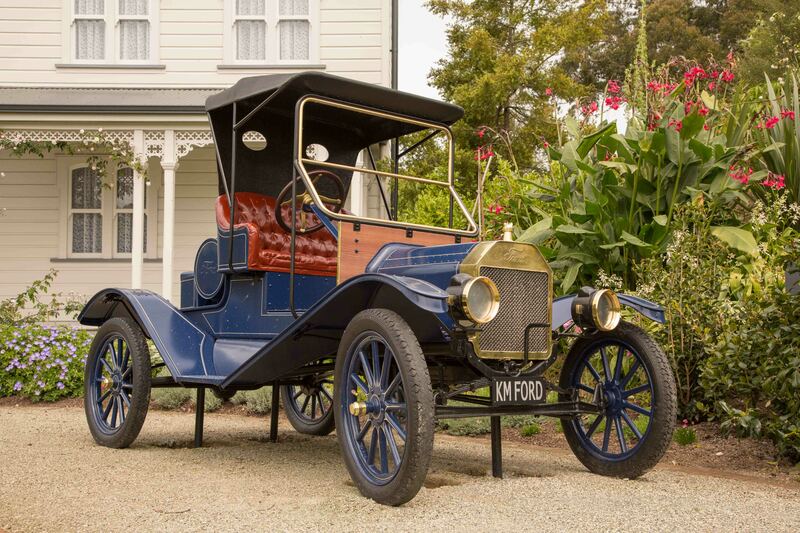 The Edwardian era Ford Model T was chosen for the Mansfield Garden to tie into the story’s Edwardian setting. 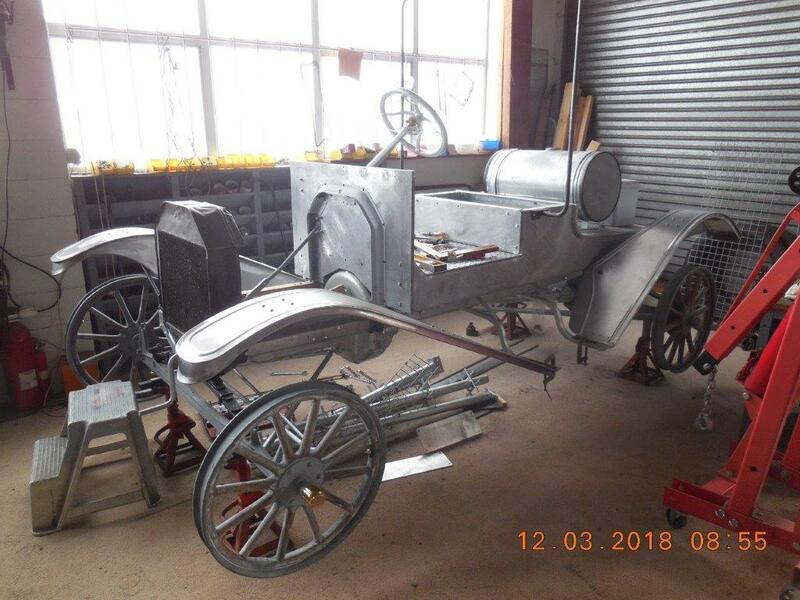 The construction of the car was a community project facilitated by the Waikato Veteran & Vintage Car Club Inc and the Friends of Hamilton Gardens and convened by Reece Burnett. 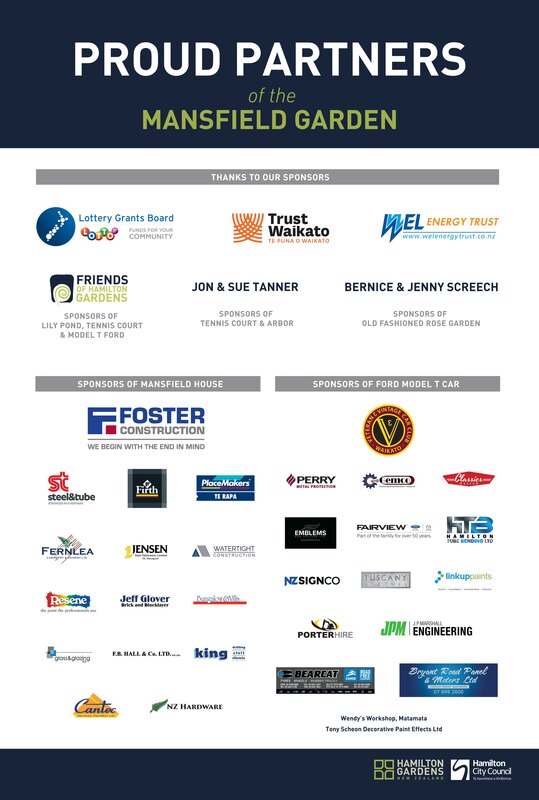 More than 30 individuals and Waikato companies were involved in providing time, expertise, materials and funding for its construction. In her story, Mansfield describes the 15 kinds of sandwiches with the crusts cut off and ‘Godber’s famous cream puffs’. 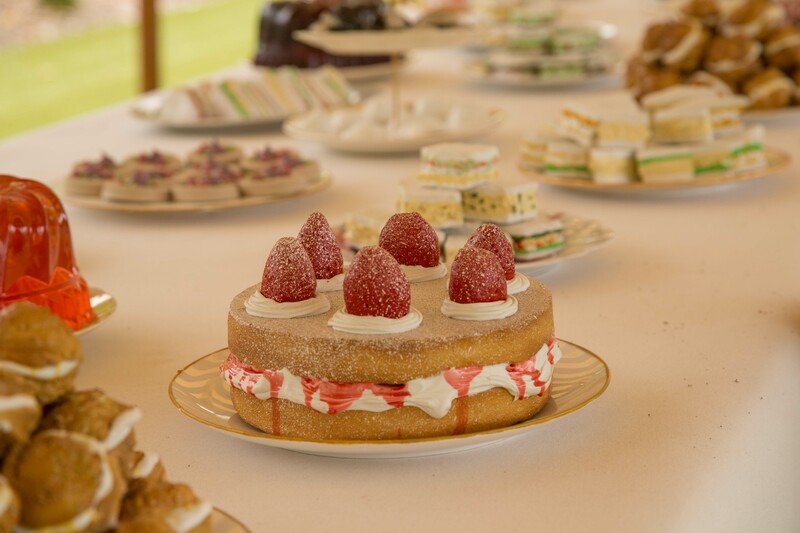 While the names of several people she knew in New Zealand were changed before incorporating them into The Garden Party, Mansfield made no effort to disguise the identity of the most successful baker, confectioner and caterer in Wellington at the turn of the 20th century, whose name was James Godber. According to the New Zealand Times, he had “a very fine delivery van…kept to deliver stock to order” and was well known for his “pastry, buns, fancy cakes, scones, cream puffs, girdle scones”. We are told that the Sheridan’s cook had made 15 kinds of sandwich. Only two kinds were specified: cream cheese with lemon curd; egg and olive. Our food was researched by Emeritus Professor Helen Leach (University of Otago) and Hamilton caterer Lizzie Dickson, and constructed from resin and concrete by artist Sacha Lauchlan. Cups and saucers were created by Tuscany Statues. Katherine Mansfield was born into a socially prominent family in Wellington, as Kathleen Mansfield Beauchamp. She lived in a small wooden house on Tinakori Road in Thorndon with her two older sisters, a younger sister and brother. In 1893, the Mansfield family moved to the country suburb of Karori where Mansfield spent the happiest years of her childhood. However, she eventually found the confines of colonial Edwardian life stifling and sought inspiration for a new way of living in the writings of Oscar Wilde and other ‘decadents’. At 19, Mansfield left for London without her family to pursue a career as a professional cello player. She never returned. She had many voyages, several lovers and counted among her friends Virginia Woolf, D.H. Lawrence, Francis Carco and the American artist Anne Estelle Rice. In 1911, Katherine Mansfield’s first published collection of short stories In a German Pension was received with success. Reviews spoke of ‘acute insight’ and ‘unquenchable humour’. She then contributed to the avant-garde publication Rhythm, with her partner and husband-to-be, literary critic John Middleton Murry. The death of her young brother, Leslie, in the First World War, devastated her and she found solace in her remembrance of the country of their childhood. These remembrances were transformed into some of her finest writing such as At the Bay, The Garden Party and Prelude. In 1917, she was diagnosed with extrapulmonary tuberculosis, which led to her death at age 34.